With the help of a child-like ancient named Mite, Rayne finds acceptance in anonymity at the Camp of the Forgotten. But when the children of the camp are threatened, will he reveal the truth and come to their aid, or walk away? And, if he accepts again his calling, will he have the strength to reclaim the three remaining scrolls, and defeat the approaching menace? While Rayne struggles with his loss of faith, his friends on Corylus watch in alarm as the man they know as Prince Rayne denies his principles and claims power for himself. Suspicions escalate when the members of the Interplanetary Council die from a mysterious illness, and the young prince declares himself Imperial Emperor of all Ochen. With an enigmatic black cloud approaching across the Cameron Sea, and mind-altering shadows threatening all Ochen, will the new emperor prove himself the savior he claims to be? 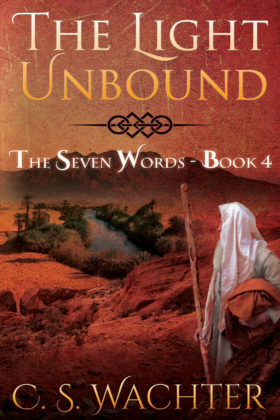 Book 4 in The Seven Words series.